Thank you for a successful Symposium! Congratulations to the poster presenters and to the awardees! The 2018 CCMR Symposium took place on May 23 on the Ithaca campus. It gathered 114 attendees from industry and academia. 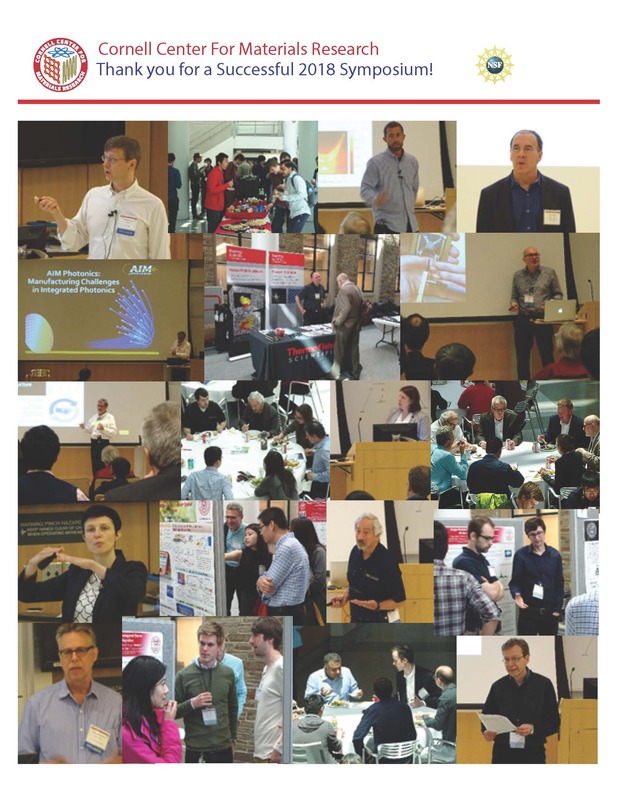 Forty-three representatives of 7 academic institutions and 17 companies networked with Cornell faculty and Symposium speakers and learned more about novel photonics technologies developed at Cornell University, in other academic institutions and in industry. The Symposium organizers, Professors Gennady Shvets and Gregory Fuchs, Cornell Applied and Engineering Physics, were joined by the 2018 CCMR Symposium Keynote Sproull Lecturer: Prof. Mikhail Lukin, Harvard University, a world-leading expert on the studies of quantum systems; Dr. Michael Liehr, Chief Executive Officer of the American Institute for Manufacturing (AIM) Photonics; Dr. Aleksandra Boskovic, Optics, Surfaces and Integration Technologies Director, Corning Incorporated; Prof. Roberto Morandotti, Energy Materials Telecommunications, Canada National Institute of Scientific Research; Dr. David Weiss, Advanced Research Director, Molecular Glasses, Inc.; Dr. Gary Greenburg, Program Officer, Gordon and Betty Moore Foundation; Prof. Nick Vamivakas, Optics, University of Rochester; and Prof. Nicole Benedek, Cornell Materials Science and Engineering. From research to applications, Prof. Michael Liehr gave an overview of the goals of AIM Photonics demonstrating its ability to engage with partners world-wide to advance the state of the art of quantum computing and to combine research flexibility with fab operational manufacturing. The perspectives of a startup, a large company and a foundation were represented by Dr. David Weiss, Molecular Glasses, Rochester NY; Dr. Aleksandra Boskovic, Corning Inc.; and Dr. Gary Greenburg, Gordon and Betty Moore Foundation. Dr. Boskovic talked about Corning’s new optical fibers, new quantum materials and structured glass surfaces with functionalities that will enable quantum communication. Dr. Greenburg reviewed the Foundations’ Emergent Phenomena in Quantum Systems (EPiQS) program that includes materials synthesis, experiment and theory, and crosses the boundaries among physics, chemistry and materials science. He highlighted the Foundation’s funding of an international group of scientists, who are attempting to to make a miniaturized particle accelerator by placing it on a chip, reducing its size to a shoebox by converging technologies of nanofabrication and solid-state lasers and combining them.